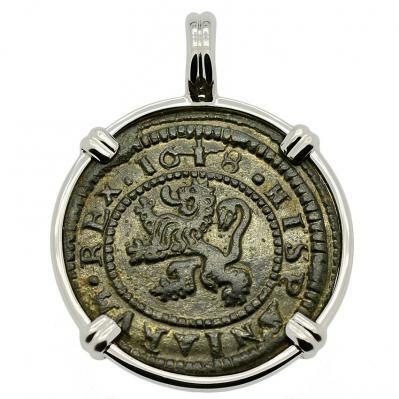 SOLD King Philip III Four Maravedis Pendant; Please Explore Our Spanish Treasure Pendants For Similar Items. This Spanish copper coin was minted in Segovia, Spain during the rule of King Philip III. 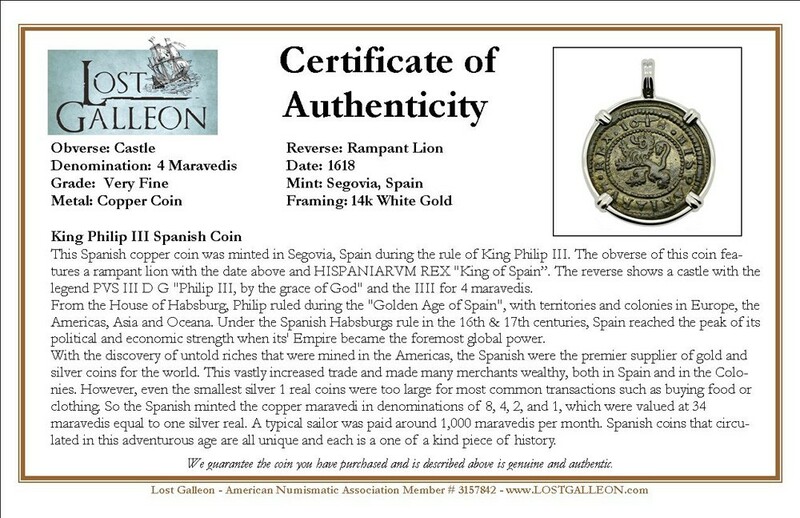 The obverse of this coin features a rampant lion with the date above and HISPANIARVM REX "King of Spain”. The reverse shows a castle with the legend PVS III D G "Philip III, by the grace of God" and the IIII for 4 maravedis. From the House of Habsburg, Philip ruled during the "Golden Age of Spain", with territories and colonies in Europe, the Americas, Asia and Oceana. Under the Spanish Habsburgs rule in the 16th & 17th centuries, Spain reached the peak of its political and economic strength when its' Empire became the foremost global power. With the discovery of untold riches that were mined in the Americas, the Spanish were the premier supplier of gold and silver coins for the world. This vastly increased trade and made many merchants wealthy, both in Spain and in the Colonies. However, even the smallest silver 1 real coins were too large for most common transactions such as buying food or clothing. So the Spanish minted the copper maravedi in denominations of 8, 4, 2, and 1, which were valued at 34 maravedis equal to one silver real. A typical sailor was paid around 1,000 maravedis per month. 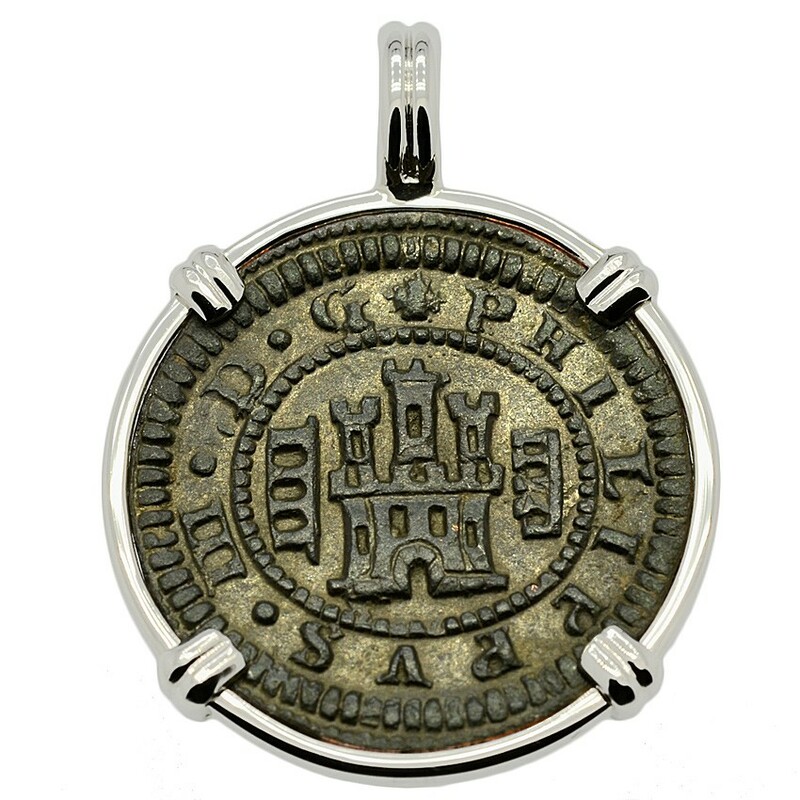 Spanish coins that circulated in this adventurous age are all unique and each is a one of a kind piece of history.